This entry was posted in Skip Allen & Painter 12 and tagged Buttery Oils, Corel Painter 12 Class, Corel Painter 12 Tutorial Video, Corel Painter 12. Karen Bonaker, Corel Painter 12.2, Digital Art Academy, Elaina Moore-Kelly, Holiday Open Studio. Bookmark the permalink. 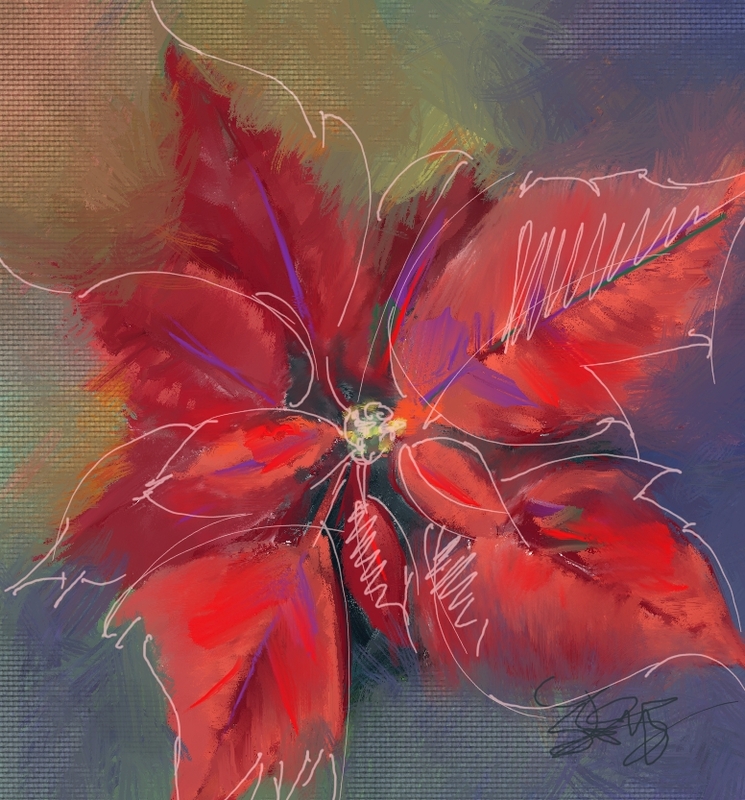 I love the look of this Poinsettia…the pencil scribbles…the combination of textured and non-textured areas of the canvas, the free form look. Just beautiful. I can’t wait to see your Holiday Open Studio lesson teaching us how to draw and paint this gorgeous Holiday symbol. I hope I can get a video of it…LOL. I’m looking forward to your classes, too. Absolutely beautiful!! I look forward to the video! I hope I can get it fixed. I have failed so far. Thanks for visiting and commenting. Thanks for that valuable feedback. I will try to keep that in mind and share more about the thought processes. Skip, you could paint with a stub and it would be beautiful!!! Looks terrific. Awe Janet…what a nice compliment. Thanks bunches. Love the “look of this” Skip !! Look forward to the video !! Thanks Judi…I hope I can get the video fixed…so far…nothing. As always I am such a fan of your work. Love the loose layered technique. Thanks Eva…I am a fan of controlled chaos…LOL. I do like using layers, but I didn’t use many in this image. The trick is to give it that layered look. Skip I love this! I’ve missed playing with Painter. It’s structured yet organic with a delicious amount of variation of texture and bold colors!! Thanks. If the video had worked, you may have laughed and thought differently about the image. I’ll still be benefiting from the WC class. Thanks for the comment. I’ll miss you in HOS. But, we can still play in the watercolor class. Oh hah! Bad video .. hah! .. this turned out sooo beautifullly that you are just going to keep your techniques a big secret!!!! :>) … seriously Skip, this really is gorgeous … I love everything about it, even the fact that I couldn’t do it!!!! .. this is the kind of work that makes my heart and soul jump up and down when I see!!!! Hey Charlie, Thank you so much. But be careful with that soul and heart jumping. Make sure you stay intact. The video is really busted. I promise there were no secrets. I’ll give it another shot tomorrow. Are you sure…I know it is getting cold up there and the fleas are looking for a free trip inside. You could be a great transport. beautiful , can’t wait to see it and hear you lough at your oopses . thank you for the inspiration you project . Thanks bunches, unfortunately I was unable to fix the video, but I’m sure I’ll have laughter and oops in the next one. That poinsettia is just beautiful! I am really looking forward to Holiday Open Studio. For anyone reading this and considering taking a class from Skip but may be thinking they are unsure….TAKE A CLASS (one or more) . . . Skip is a great teacher, gives excellent guidance, answers all questions very well, provides tools, tips, videos, etc. to make our life as student a fun learning experience. 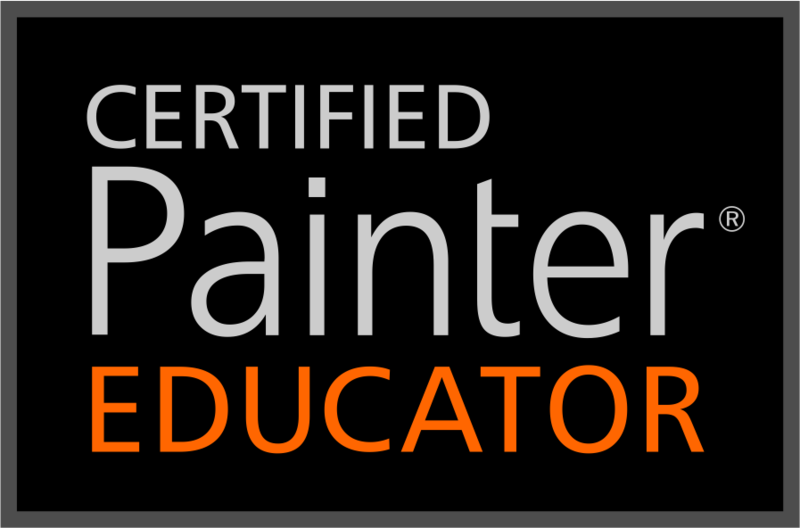 Skip knows Painter inside and out and not only teaches, but uses it….as well as other tools along with Painter such as Wacom tablets. Pass the word to your friends too!